Time in the shop over the past week has been hit or miss. Every little bit adds up though. The lower aprons are now installed. Which means that the case assembly is now complete. It was at this point that I ran into a little trouble. 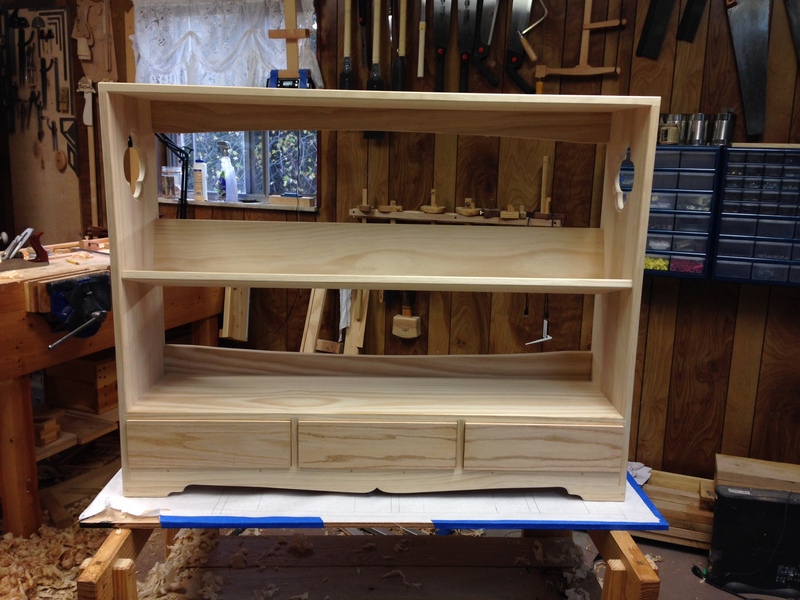 This bookcase is the largest thing that I have built and finish planing presented a bit of a challenge. Up until now my assemblies have been small enough that I could either finish plane them on the bench or place them on low sawhorses and pin them against the bench. Neither of those options were viable for this bookcase. So I had to get creative. In the end, I managed to place the bookcase on a platform that I installed on my trestles. 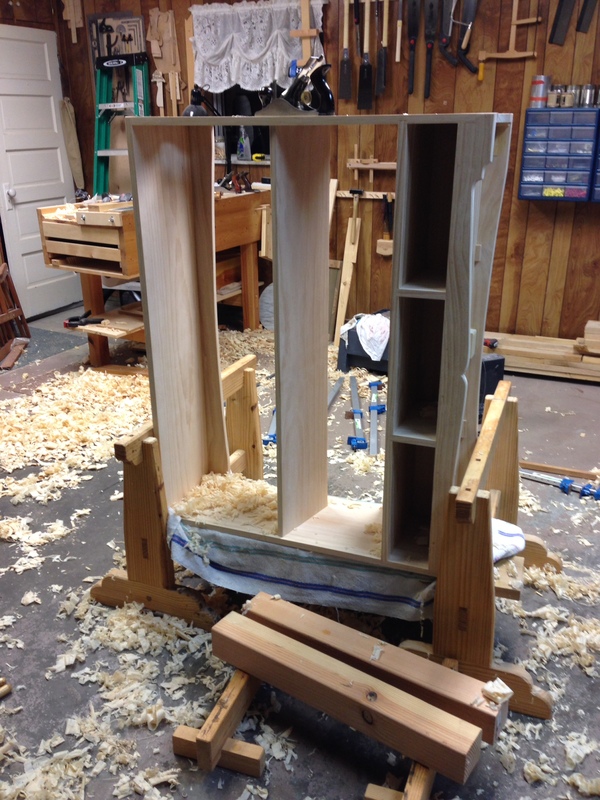 The trestles held the bookcase fairly securely and I used a few different improvised step stools to gain the height advantage that I needed to plane the surfaces. Although awkward, it got the job done. 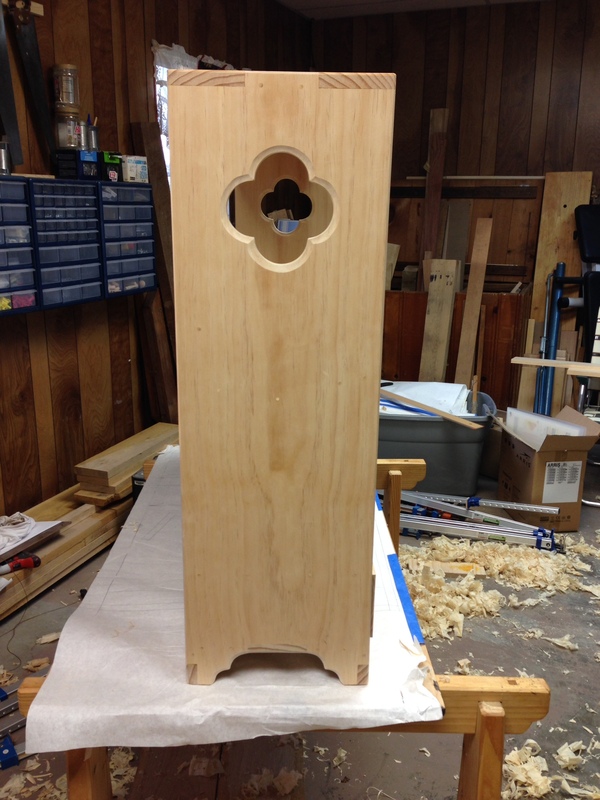 Once the case was cleaned up, it still needs a light sanding before finishing, I completed the decorative details that make up the feet on each side panel. A little rasp and file work, followed up with the gouge and finally a little sanding. Being that it is Saturday, I had hoped for a full day in the shop. However, an unanticipated “honey-do” assignment from management dashed those hopes. I did manage a little time in the shop though. Remember, every little bit helps. Most of my projects are built with pine. I enjoy working with it. Its easy to obtain and reasonably priced. However, a lot of pine in a project can look, for lack of a better word, boring. Sometimes I add decorative elements such as kolrosing (aka. hillbilly inlay) or a stamped design of some sort. Paint is another way I try to add a little visual interest as well. One of my favorite ways of breaking up the expanses of pine is to make my drawer fronts from a different wood species. I’ve been fighting the urge to add any kolrosing or stamping to this bookcase. I’m afraid that it would look too “busy” once the shelves are loaded with books of varying colors and spine designs. So I’m shooting for a clean look. I am indulging in a different wood for my drawer fronts though. A quick rummage thru the wood pile and I came out with three pieces of salvaged oak. Once I cleaned them up I realized that they were consecutive pieces. So I got a bonus grain match! 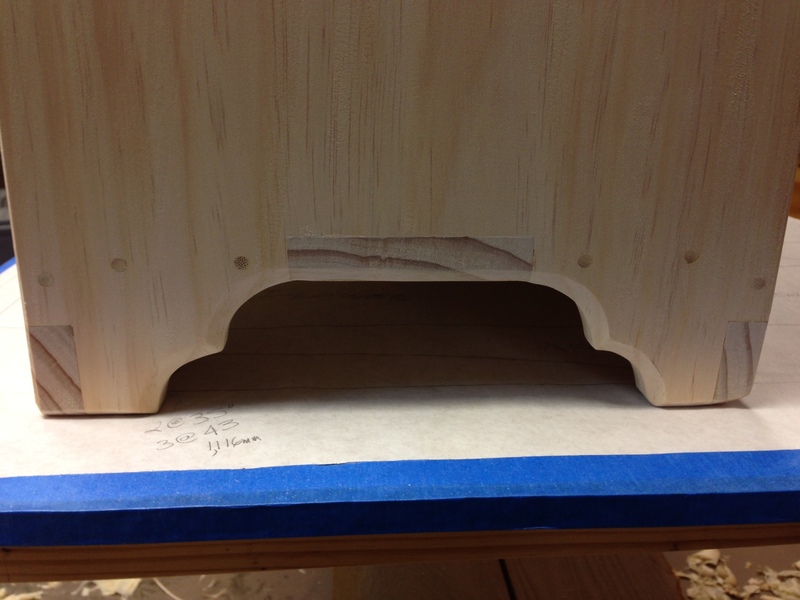 Maybe tomorrow I can work up the drawer sides and backs. Heck, maybe I’ll even start building the drawers themselves. 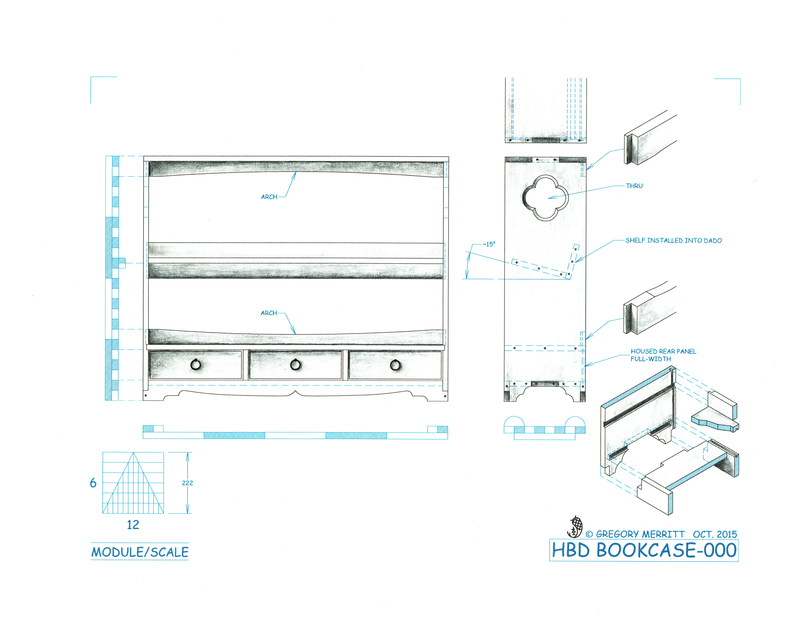 This entry was posted in HBD Bookcase and tagged bookcase, drawer fronts, gouge. Bookmark the permalink.